On our way we passed Oxwich Burrows and Oxwich Nature Reserve and eventually came to Oxwich itself, which is a very nondescript little seaside village. At the end of the beach we came across a path that would eventually lead to Oxwich point, so we decided to explore a little further!! 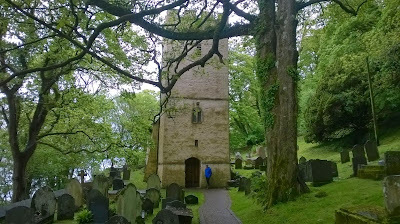 The path gently rose upwards and lead to St. Illtyd's Church which originates from the 6th Century, with later additions in the 14th Century, so as you would imagine most of the grave stones in the Church yard were really ancient but interestingly, some were from as recently as 2010. A rare sight, John going into Church! We continued along the path thinking we would only go a little further as it started to rise very steeply, and then the steps begun. It went up and up and up, and at one stage I thought I might eventually get to heaven - but no, more steps, down this time. And so the path went on, up and down and down and up and never seemingly getting to the Point! Having still not reached our goal by 5pm we decided it was time to call it a day and retrace our steps - down and up and up and down - but the path was lovely really. 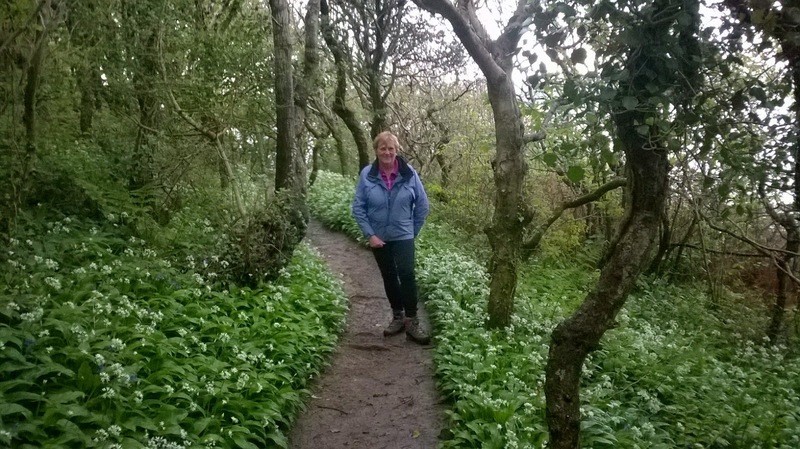 It went through old woodland with myriads of blue bells and wild garlic lining its edges and with the odd glimpse of the sea through the foliage. 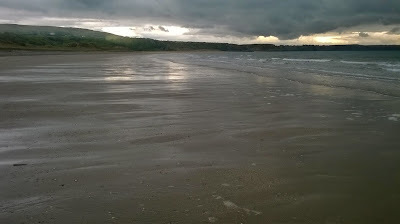 Once back on the beach we had wonderful views of the outgoing tide, the glistening sand and the clouds breaking on the horizon to allow a glimmer of light in the dark skies just before sunset. We made our way back to the Tardis for a lovely supper of good old Aldi's marinaded salmon and Jersey Royals. Today was a cycling day and we had two goals for our trip! The first being to go to St Eynon's Bay and the second to Rhossili, which we had visited before many years ago. Although the terrain wasn't overly challenging it was a bit up hill and down dale and the 23 miles that we rode were certainly far enough. It took us about an hour and 15 minuets to get to St Eynon's Bay so that seemed a very good place to stop for coffee and cake while overlooking the extensive Carreglwyd Caravan and Camping Site - another one to add to our list for future use. It extended over 4 massive camping fields that had fantastic views overlooking the bay and there was even a fish and chip shop on site for supper! 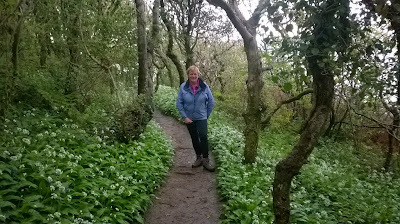 After our break we continued on our way (up a steep hill) to Rhossili and to our ultimate goal - Worm's head. The land around here all belongs to the National Trust, but luckily for us, the path leading to the head is a bridle path, so we were able to cycle. We set out our picnic blanket and ate our late lunch while watching the tide wash over the causeway leading across to Worm's Head, and from our vantage point we could also see the surfers on Rhossili beach, and in the background Rhossili Down climbing up to a dizzy height of 193 metres. As the afternoon wore on, the cloud started to thicken so we decided it was time to make our way home, but on the way we decided we needed to support local trade so we stopped to buy a couple of bottles of Taffy's Apple Cider - just what we needed after a long ride. Time to move on tomorrow to our next destination which will be St David's.